The Power Surge Protector is designed to protect your equipment from high amperage surges due to lightning strikes on aerials or masts in close proximity to the mobile booster device. 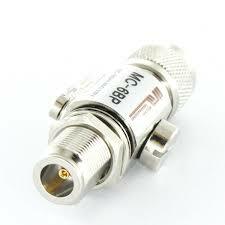 This unit is rated for 18kA of the current surge and is very simple to install on any mobile repeater system. The surge protector should be installed in-line with the external aerial connected to the ‘Outdoor’ port of the repeater either near the external aerial or the repeater. The surge protector has N-type female and N-type male connections on either end. It also has an earthing port that should be connected to a local earth connection nearby. The Mobile Booster surge protector is always recommended for any installation to avoid damage from lightning strikes.